most famous Founder of Philosophy. might be the very thing we’re looking for. from home, explaining just that sort of thing. did damage to it that I couldn’t fix. the course of study I define for you. a blend of nonsense with absurdity. all thinkers since the classic Golden Age. originating in the classic past. can see no useful work was left to do. “and not in Speculation to engage. and listened closely, as the centaur spoke. the grounds for all the progress later made. to search for Generalized Validity. and seek conclusions general and abstract. for which the ‘Moderns’ deemed themselves so wise. on which we place all present emphasis. which in still-older times and cultures rose. the Basic Nature of Reality. with Thales of Miletus to begin. without it, not a blade of grass could grow. it should be unrestricted, have no bound. is just as indigestible as rocks. split into silicon and oxygen. is the most vital element of air! abides by laws numerically expressed. to start life over, in Some Other State. and Change was also much in evidence. between adjacent points along a line. one-half the distance has to be transversed. that nothing’s ever absolutely true. that we’re convinced of it, by Argument. that nothing much, if anything, is Real. of words to ‘prove’ whatever ‘truths’ they please. the vague impression they had proved a myth. exempting nothing from our questionings. is using and developing the Mind. that Virtue’s locus is the Intellect. between the ears and just behind the eyes. Sound Judgment, are their moral standards slack. the damage done to one’s own character. exactly where our best self-interest lies. despite self-interest, simply by mistake! they’d have the sense to think before they act. that evil deeds from Ignorance arise. and Error is the only thing involved. of Western science and philosophy. with that required to run Affairs of State. and elevate the Philosophic Mind. who would the central government comprise. in place of popular mythology. needs more endowments than a silver spoon. supplies the bribes to pave his way to fame. not once has his ingenious plan been tried! and then Scholastics, for two thousand years. and every possible Solution found. can add to what the Greeks devised themselves. of Grecian Thought, by even half a page. . .
since Dusk approaches, both of us should leave. ‘fair game’–like that atrocious minotaur. and turned to face along the forest track. the Sage had done, he set off through the wood. at pending dusk, and prudently withdrew. iCrew Digital Productions is proud to announce that it is publishing The Apes of Eden by Jon P. Gunn in October. 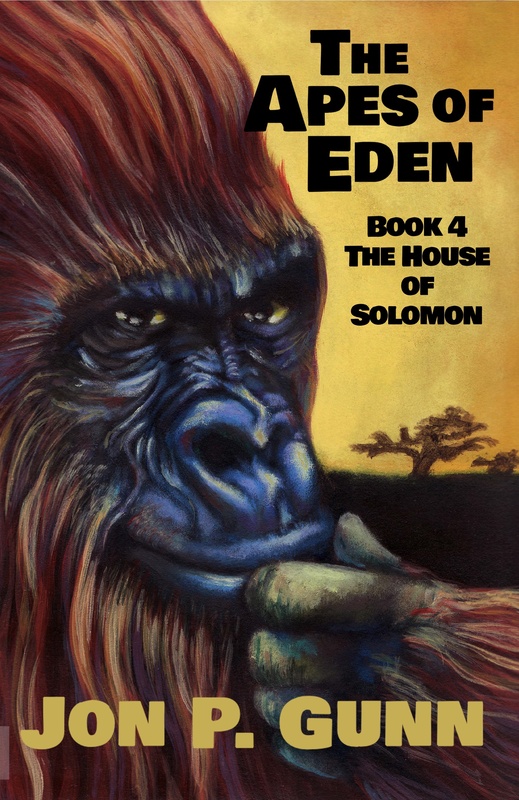 The Adobe Acrobat file below contains Book 1 of The Apes of Eden Saga. The Journey Begins will contain the first three. It is a different type of read from what you are used to. If you don’t catch on to it, that’s not a problem. If you do, let me know. I am thinking and hoping that this book is special. I have had the manuscript for nearly thirty years. Let me know what you think and pass it on if you know someone interested. the way we found our noses pointed: west. of Eden’s borders, novelties were few. were less diverse in their varieties. sufficient. Day by day we found our fill. then asked our Sage which way we ought to go. had rolled Repugnant Matter up in it. displayed a talent for profanity. describe our natures, in a mighty rage. discarded it in anger and disgust. he found himself completely on his own. He pondered, scratched his head, and looked depressed. we’d just retrace our tracks by heading east. The Tribe set forth, with aspirations high. We made brave pledges: We’d succeed or die. to rolling hills, and then a mountain range. –or so the ancient chroniclers aver. Outside our home, the world’s constructed wrong. and wildlife made good use of claws and horns. we’d had no natural enemies at all. these malcontents rebelled, and trooped away. the tribal glory we would someday earn. of Pithecanic Destiny and such. Our current woes, he said, were nothing much. “Too long in useless indolence we dwelled! The Tribe thrust deeper into wilderness. The bounty of the land grew less and less. sheer lack of forage drove us on again. our curiosity to see the world had grown. we wanted, now, to see how far it went. unknown before. We found that Teamwork pays. of us could fight them off, by swinging sticks. till real scarcities had changed our mood. Thereafter, all our searching was for food. ahead of time. We next encountered Snow. Our teeth began to chatter–then our bones. Our feet and fingers grew as numb as stones. in hopes repatriation rules were slack. It’s doubtful that they got to Eden, though. back east. We evidently had to stay. impressed us as a chilly way to die. we tried to scale the ridges, once or twice. Our mountain climbers started through the snow. An icy canyon wind began to blow. they weren’t conditioned to that sort of thing. We found their frozen corpses in the spring. and hoped spring thaws our confines would extend. were food for any race, much less our own. especially in times of pressing need. although our first techniques were rude and rough. then inhumanely cudgeled it to death. is “one who eats all foods” –then looks for more. were chewed on for the protein they contain. we went on eating nearly everything. –and then the attitudes–of beasts of prey. rebounding from a skull as hard as ice. for food, but lest we, too, be killed for meat. a longhorn cattle head, which hardly matched. the pasturage, but lived on fresh-killed meat. says minotaurs had tails, just like a cow. the Axe, the Tomahawk, the stone-tipped Spear. With better tools, we dealt more deadly blows. We blared on sheep horns, to out-roar our foes. but no invention brought us lives of ease. we found excuse to tackle bigger game. was Ape emancipated from the trees. a winner in the Struggle to Survive! and Eden buried in the trash of time. with brains between his ears, can understand. displeases readers lacking taste and wit. I write as Eden’s classic authors wrote. of Eden keep the records of the Tribe. All tastes are not alike, I realize. I nonetheless decline to compromise! of reader savors Art, the other, tripe. There is no tepid “Middle Way” to go. or else it drives you screaming up the wall. There seems to be no neutral ground at all. I don’t expect my work to go to waste. the Literate Elite. I write for those. Let lowbrows read some Scribbler’s dreary prose. our present tribal Archives weigh a ton. as Eden’s Tribe it’s holy Quest pursues. with lighter reading ought to be content. volcano smoke, to pounce upon their prey. of Literary Treasures on his back. I’m past my prime of life: I’m getting old. A lighter load would be a boon to me. I’m not as nimble as I used to be. as chroniclers, immortalized in stone. or four editions, none of which agree. in cryptic tongues no living tribesman knows. archaic texts which none of us can read? of which in vain we ask: What Mean These Stones? have proven helpful, in a passive way. a choice material on which to write. of using dragons’ soot-black blood for ink. by giving quibblers grounds for argument. you one, coherent and definitive! No “food for thought” is lost. I promise that. I save the meat, although I trim the fat. but not a single Dragon is in sight. to interrupt me. Let’s get started, Muse! where they had ripened in the sun and breeze. before they had a Great Revolt to quell. a missing page in tribal history. the mere allusions, which are all I’ve found. since apes cannot be brusquely ordered out. but surely not without a brutal fight. from human beings. That one’s rather lame! the moral peers of mandrills or baboons! with grudging toleration by our Chief. “by evolution” from our racial foes. nor do I know which theories to believe. exists, and we originated there. to be our own distinctive tribal name? unmarred by hardships, danger, toil and strife. and every flower, in profusion grew. the vines, where grapes the size of melons hung. with breeds of flowers one would least expect. for our convenience, in profuse array. or any crop that met the moment’s needs. We pelted passersby with rinds and seeds. We made up games, then freely changed the rules. We grinned at our reflections in the pools. before we tired of ease and merriment. some Mental Ferment started to appear. unless created by a Deity. in order to exist, must have a Cause. some future poet may have need of them. decried its lack of practicality. has vastly more important things to do. this world was but a cosmic afterthought. and, point by point, out-talked us in debate. we really had the cosmos figured out. if sun or moon were only half as hot. the world might be completely rearranged. as sunshine is–we couldn’t sleep at night. so modestly? Does anybody know? these alternations of the night and day? arranged the world for us, in this respect? were vertical : where could a person stand? to our destruction down into the sky! this deft arrangement of the lands and skies? Suppose the rainfall here were slightly more. its water inundates the highet hill! where they’d have sprouted by the time they’re found? but how can chance make things a certain way ? it might be brown. Would that appeal to you? by chance? Blue apes would be a sight to see! how could we build our nests up high at night? to grow. Without them, how could fleas be caught? to be ourselves, from brain to fingernail. this world did not ‘just happen’–it was planned ! He was the greatest thinker of the age. convinced us a Divinity exists. that we, the Higher Apes, had not found God. and some do not support what others say. that’s not the only history we’ve lost. on our profession, understates the case. one doubts that others even learned to read. on me, with all these problems unresolved. a scribe too harshly, when he has to fudge. instead of lolling idly in the trees. with fear–do we deserve the title, Ape? to bask in mindless idleness and bliss? he has to hedge when asked: Have you found God? and swung excitedly from side to side. among the fronds. We quailed, and wagged our heads. its lack of object, or specific plan.